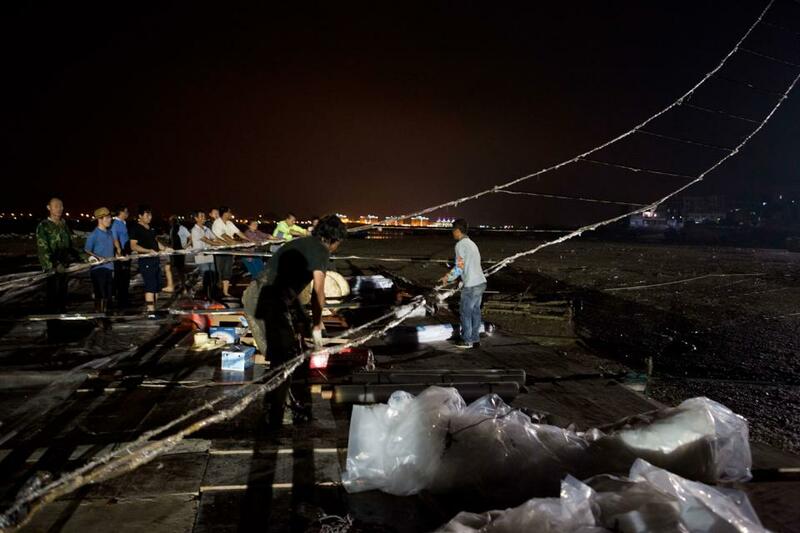 A helium balloon was used to lift the metal wire and aluminium frame up, as the fuses ignited the pyrotechnics over the Huiyu Islet off Quanzhou. 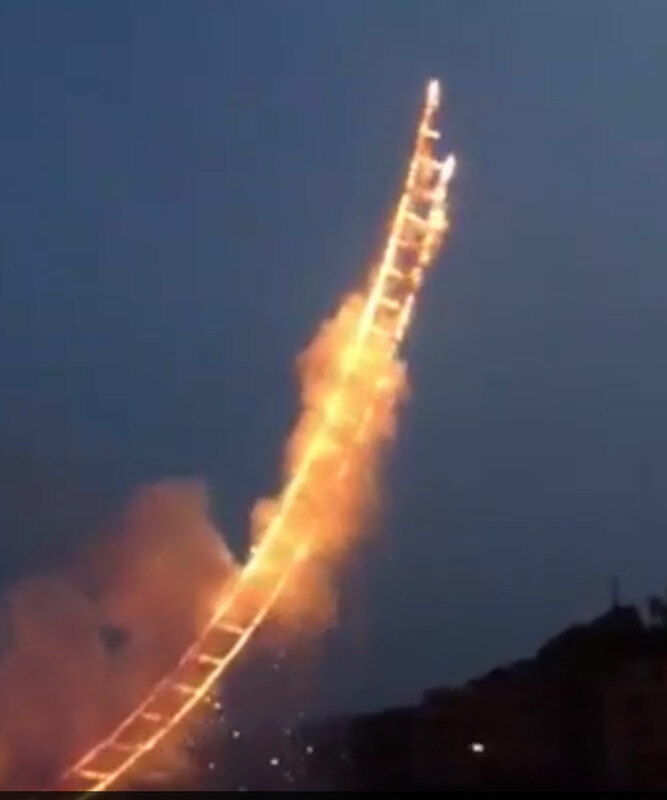 After three failed attempts that spanned over 21 years, a Chinese contemporary artist has created a 'ladder to heaven' using fireworks. 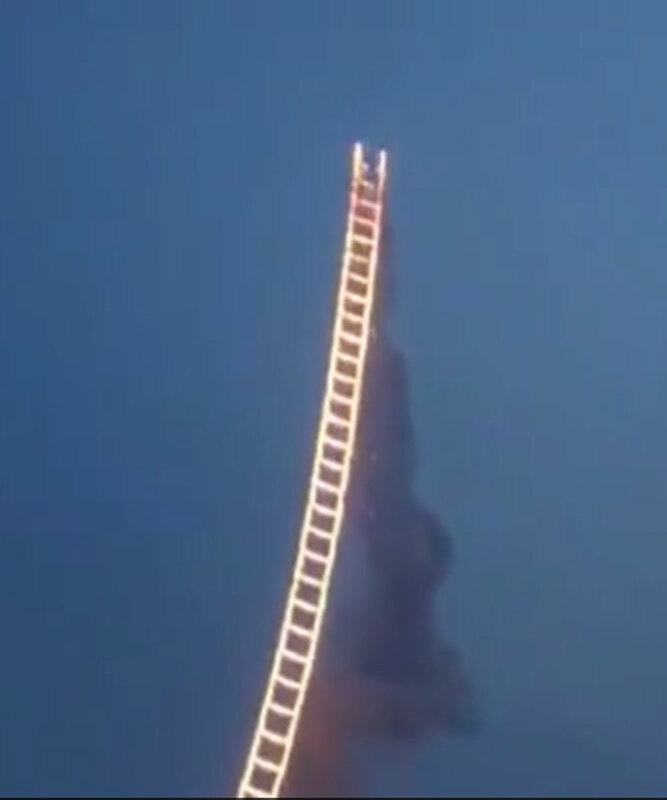 The stunning artwork - dubbed 'Sky Ladder' - is the brainchild of Cai Guo-Qiang who is currently living and working in New York City. 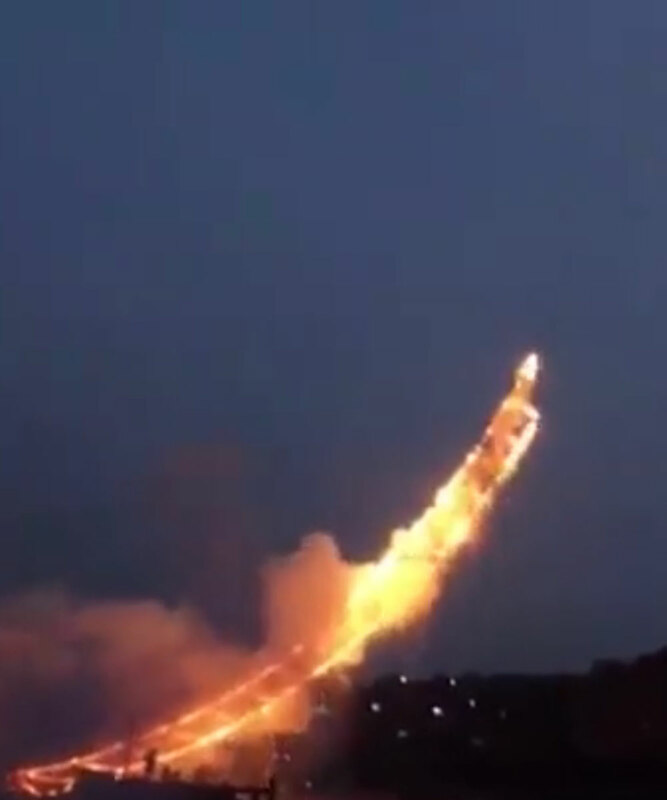 According to the Daily Mail, the 150-second spectacle soared 503 meters up into the sky in his native hometown of Quanzhou, south-eastern China, and is 5.5 meters wide. 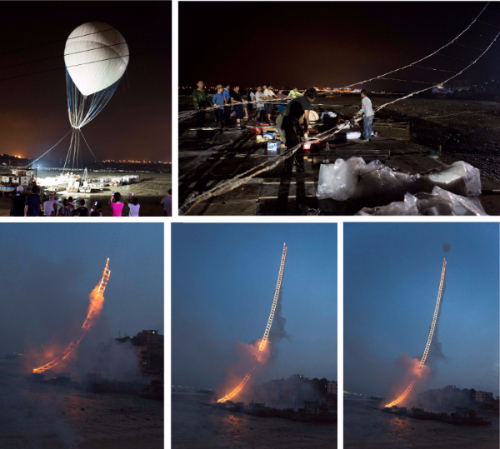 A helium balloon was used to lift the metal wire and aluminium frame to the sky, as the fuses ignited the pyrotechnics over the Huiyu Islet off Quanzhou. 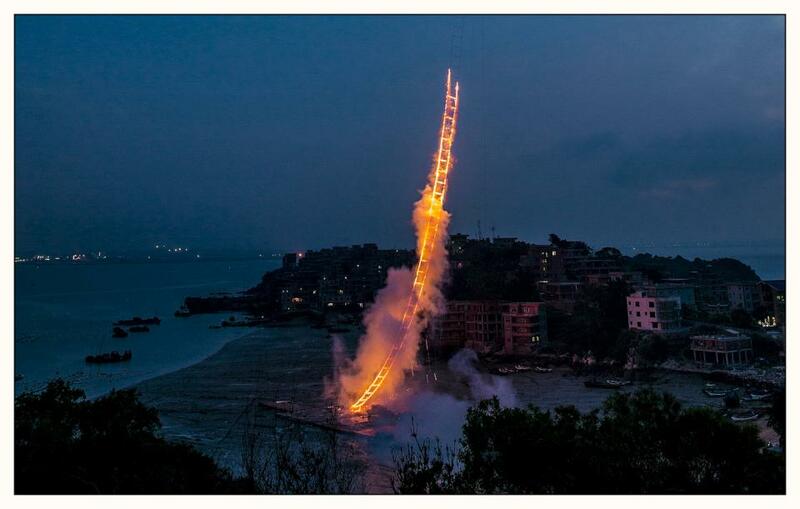 People's Daily Online reported that Sky Ladder was dedicated to Cai Guo-Qiang's 100-year-old grandmother, who was unwavering in her support to finance her grandson's dreams to be an artist. 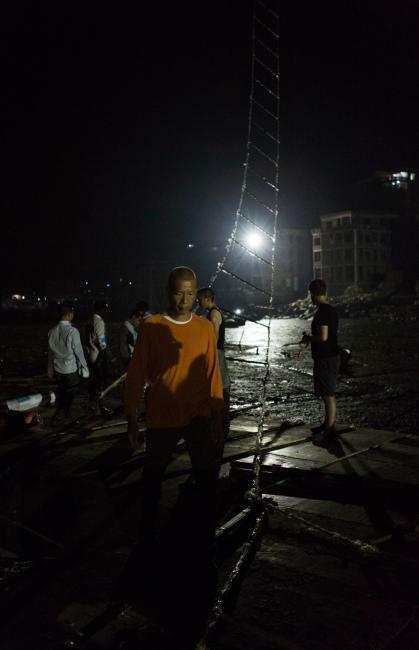 Cai Guo-Qiang's family hails from a small fishing village in Quanzhou, and his grandmother sold seafood to support the family. 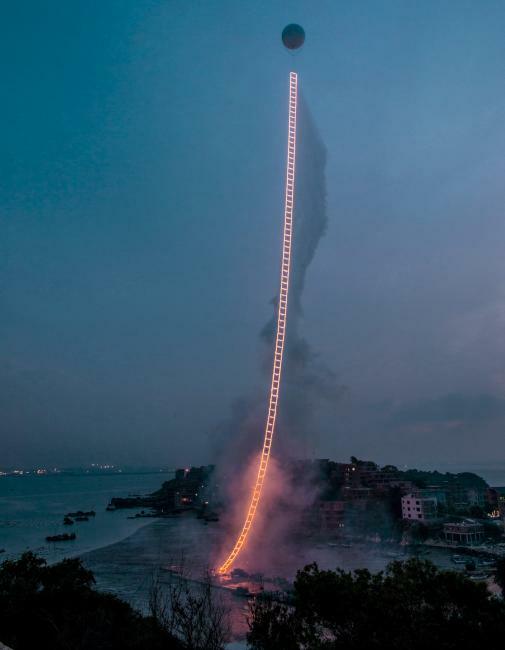 The artist first mooted the idea for Sky Ladder in 1992 while he was in Bath, England; then again in Shanghai in 2001; and finally in Los Angeles. He failed to secure the permissions for all three bids. 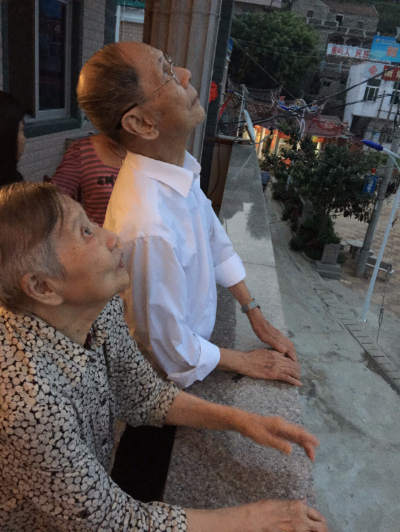 Cai Guo-Qiang's family hails from a small fishing village in Quanzhou, and his grandmother sold seafood to help Cai Guoqiang. 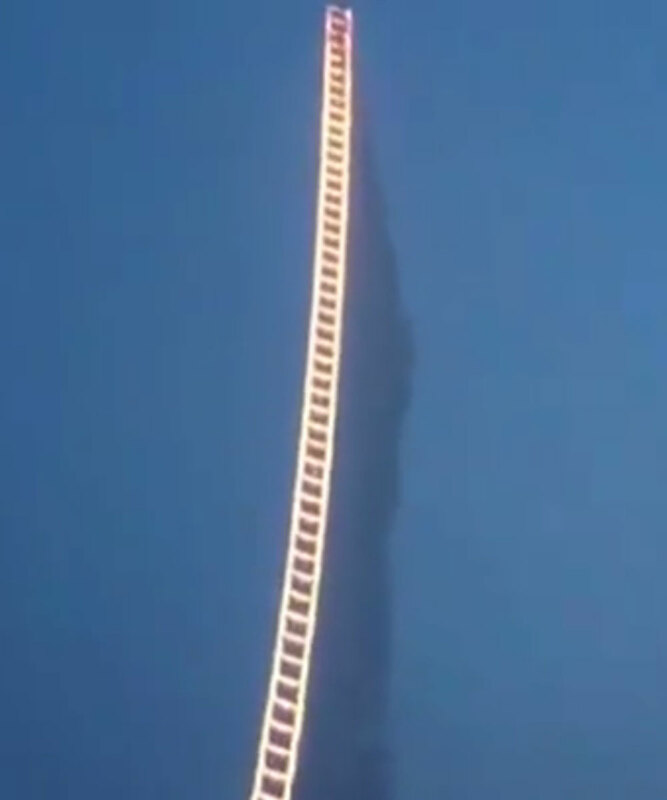 The artist first mooted the idea for Sky Ladder in 1992 while he was in Bath, England; then again in Shanghai in 2001; and finally in Los Angeles. He failed to secure the permissions for all three bids. 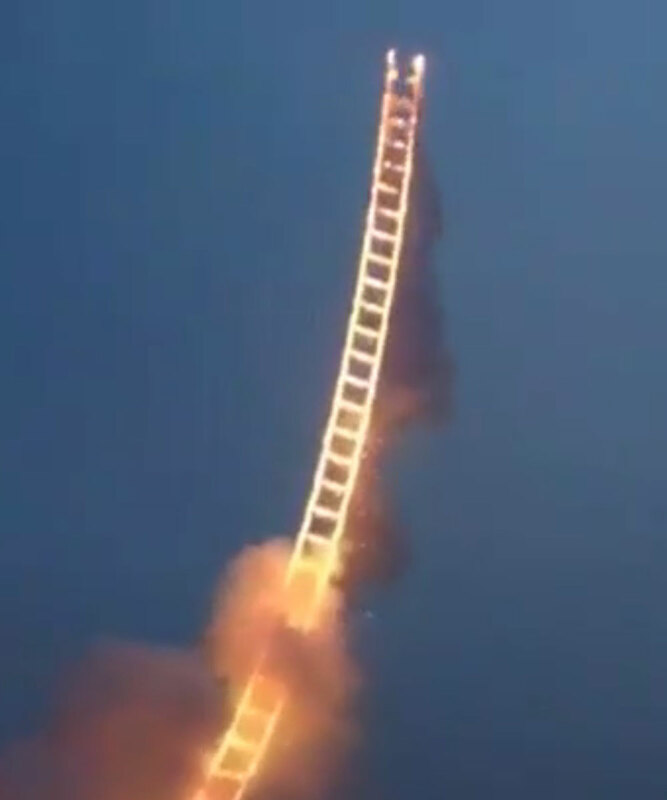 "Behind Sky Ladder lies a clear childhood dream of mine. 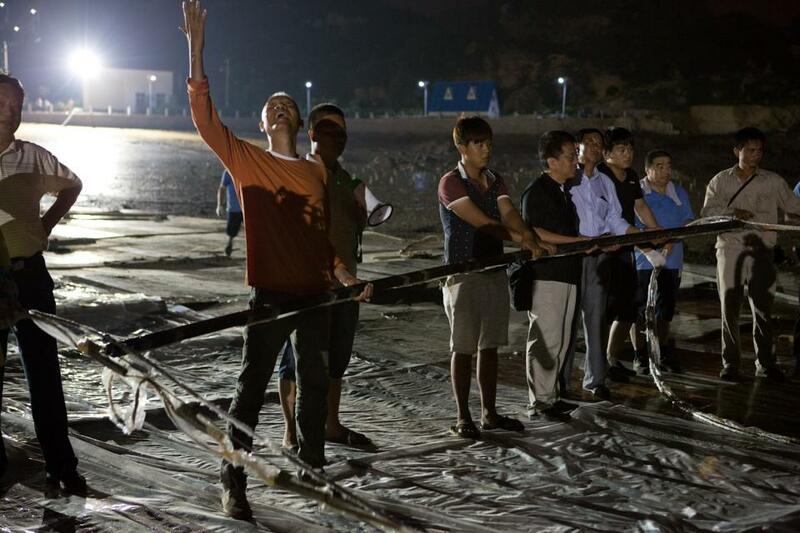 Despite all life's twists and turns, I have always been determined to realise it," Cai Guo-Qiang explained. 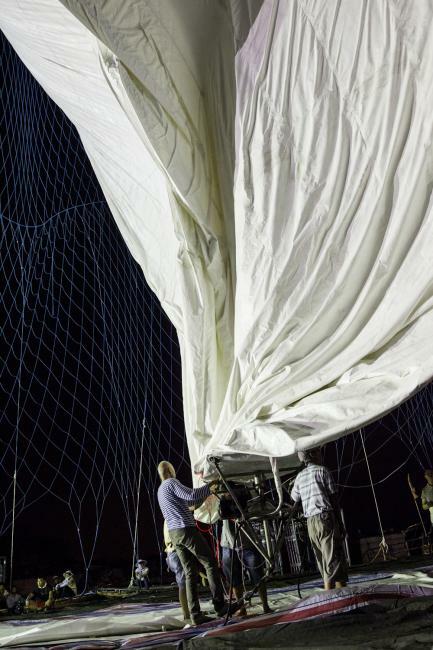 "My earlier proposals were either more abstract or ceremonial. 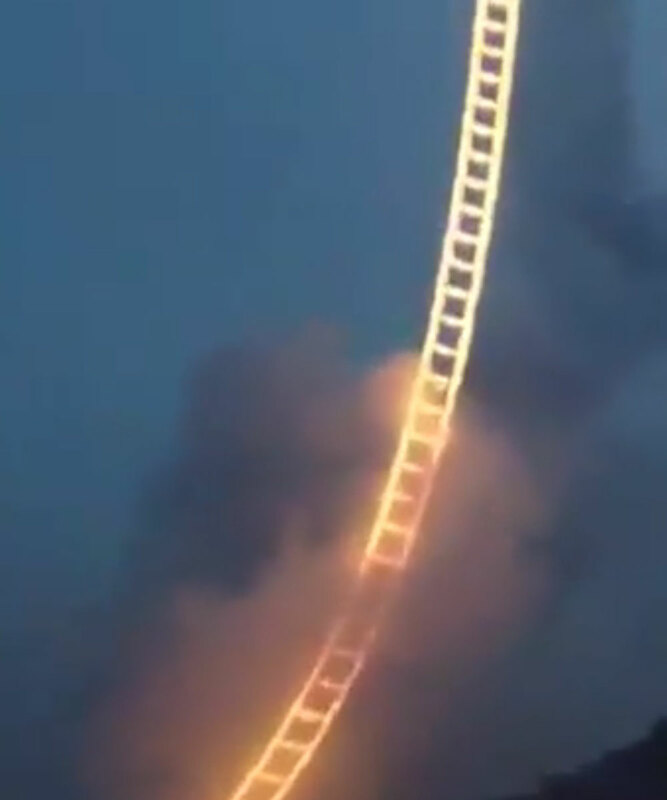 "Sky Ladder today is tender, and touches my heart deeply: it carries affection for my hometown, my relatives and my friends. "In contrast to my other attempts, which set the ignition time at dusk, this time the ladder rose toward the morning sun, carrying hope. "For me, this not only means a return but also the start of a new journey." 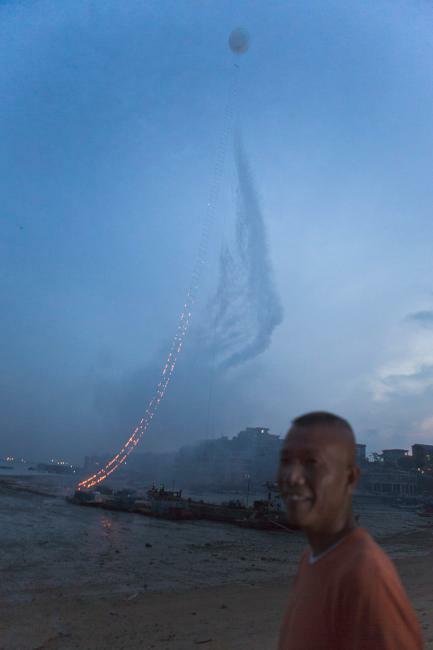 Cai Guo-Qiang is best known for using gunpowder in his works. The artist gained widespread recognition for his dazzling masterpieces curated for the 2008 Summer Olympics in Beijing, where he was the Director of Visual and Special Effects. 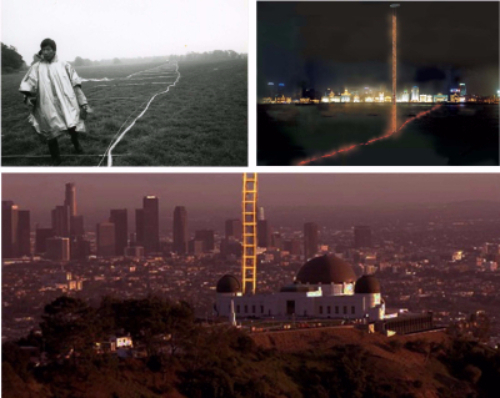 "My earlier proposals were either more abstract or ceremonial. 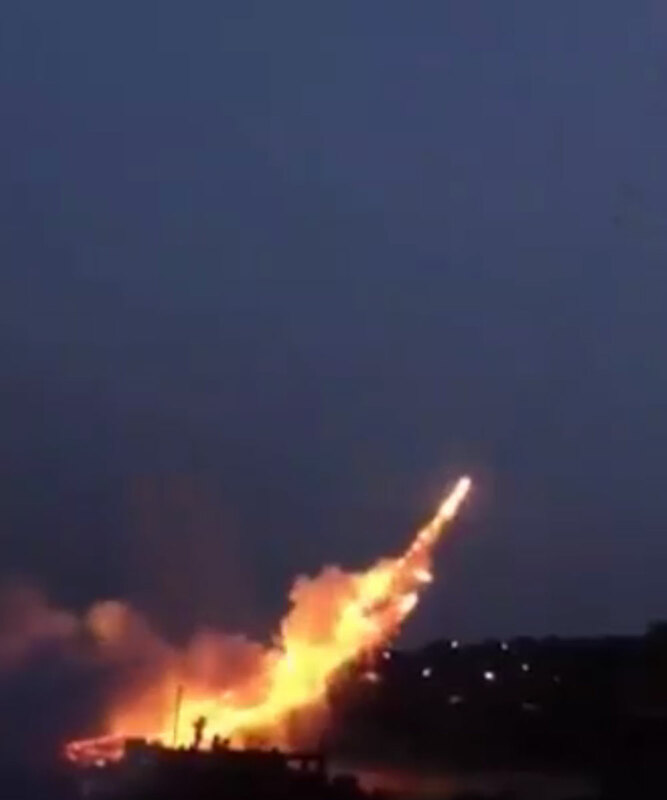 Sky Ladder today is tender, and touches my heart deeply: it carries affection for my hometown, my relatives and my friends. "In contrast to my other attempts, which set the ignition time at dusk, this time the ladder rose toward the morning sun, carrying hope. For me, this not only means a return but also the start of a new journey." 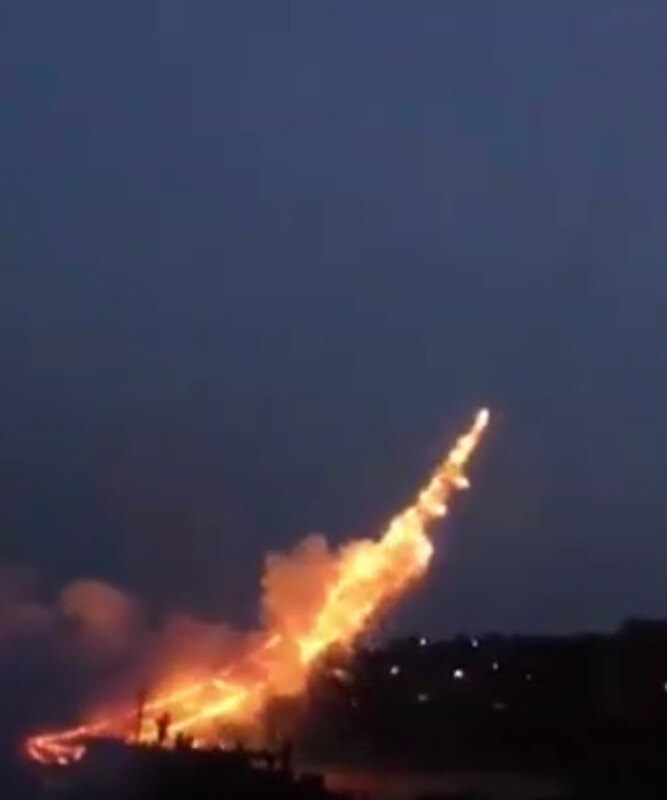 Cai Guo-Qiang is best known for using gunpowder in his works. 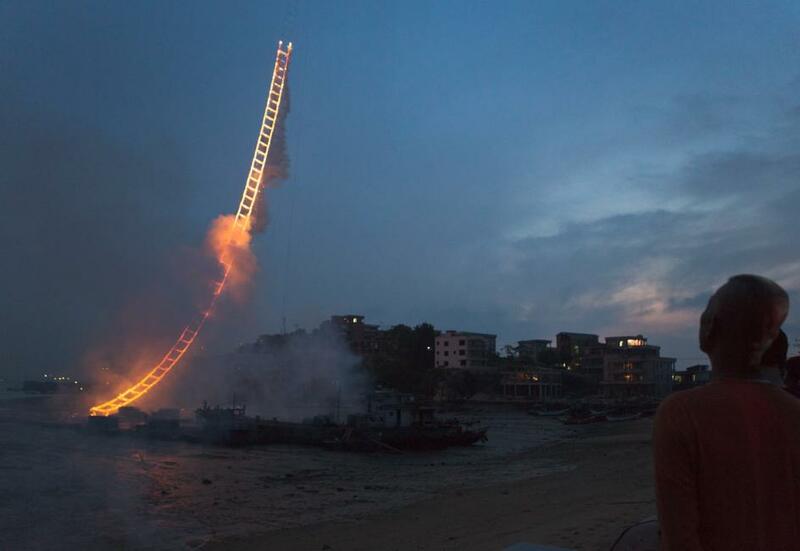 The artist gained widespread recognition for his dazzling masterpieces curated for the 2008 Summer Olympics in Beijing, where he was the Director of Visual and Special Effects.